So often we are consumed with setting the goals, drawing a straight line to their completion and moving onto the next thing. It’s deliciously tempting to think about living our entire lives that way. But magic doesn’t happen at the coal face of constant engagement with what we already know. To think about creating a different kind of life, an alternative way of being in the world, we need to change our horizons and our roadmaps, sometimes, literally. 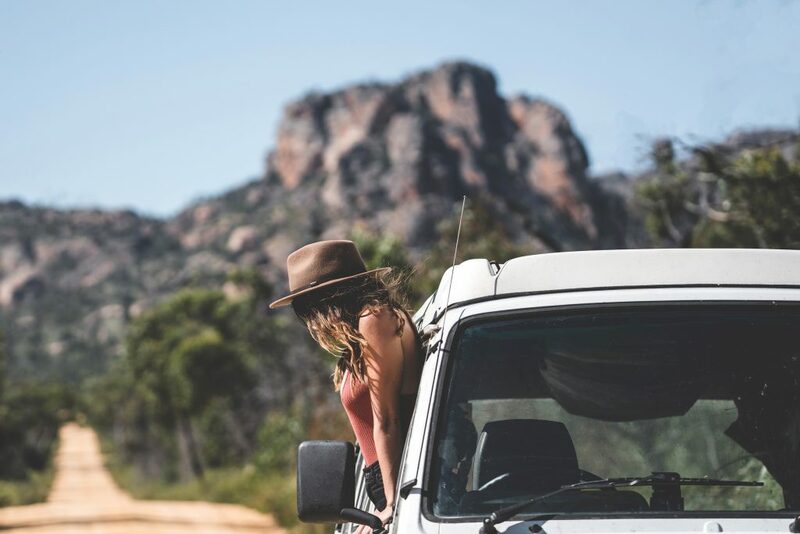 When mortgage broker Lauren Williams and freelance designer Alexander Knorr packed up for a holiday road trip around Tasmania, starting a business was not on their itinerary. But a chance forage in a town op shop to look for a hat for their journey sparked an idea. The arguments about whose turn it was to wear the vintage fedora they purchased, gradually turned into a more productive discussion about how they could bring hats like their special find to more people like them. And so Will and Bear, unisex hats for the road, came to be – but only after using their would-be house deposit to fund their first order. And these aren’t your regular pieces of headwear. Will and Bear hats are handmade from 100% Australian wool, by expert milliners in Inner Mongolia who have for generations made high-quality hats for the seasons. Lauren and Alexander also partnered with Trees.Org where for every hat sold, ten trees are planted. So not only will purchasing a hat from them keep you warm and sheltered, you’ll help counter the effects of deforestation, and support families and communities out of poverty. For all shortest routes we’ll often engineer to travel, it’s undoubtedly life’s detours were our greatest possibilities await. 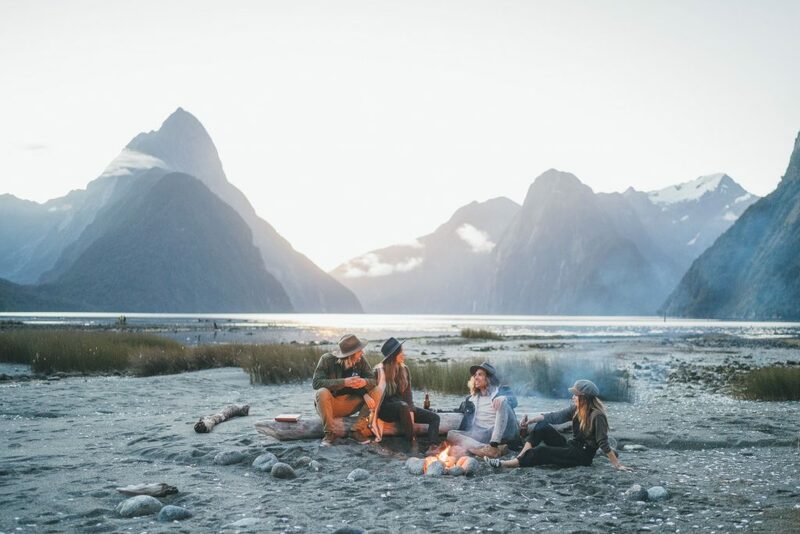 Lauren and Alex are the co-founders of Will & Bear – unisex hats for the road. For every hat sold, 10 trees are planted. Get yours here. Alex: Early on I wanted to draw for a living, maybe be an artist which lead me to design. I first opened Photoshop when I was 12. But later at school I was interested in maths and science so I combined the two to pursue design engineering. Loz: From an early age it was clear I didn’t want to follow the normal path. I always had aspirations to do my own thing. Can I say I wanted to ‘not be normal’? 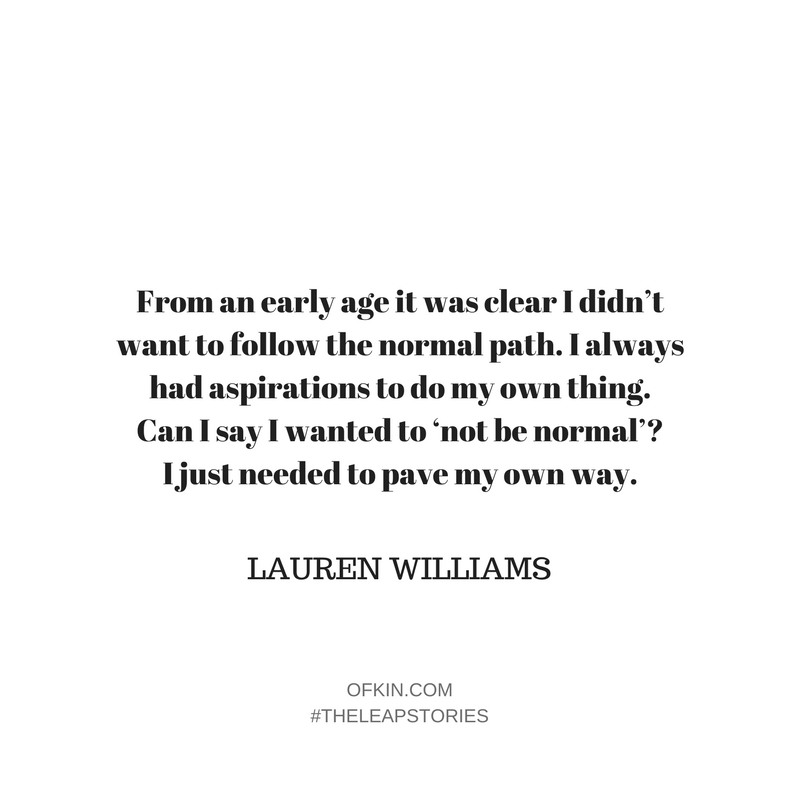 I just needed to pave my own way. Alex: Product Design Engineering at Swinburne. Loz: Self-taught (University of Google Business Degree lol)! Alex: Using what could be a house deposit to place our first order for Will & Bear. Loz: Handing in my notice for my job after 10 years to go full-time on Will & Bear. Alex & Loz: Packing up our house and moving into a van to live, work and travel around Australia. We took this leap only a few months back. Alex: Stella Knorr – My big sister paved the way for me early on. Jimmy Gleeson – Creative Director at Bellroy and good friend. Dieter Rams – Says every product designer – haha – but influential none the less. All the start-up and business owners that I was fortunate to work with as a freelancer. Loz: Alex – Gave me the confidence to take big leaps. Johnny Dustow – Co-founder of Vanlife Diaries, mental health ambassador and community builder. Elizabeth Edgcumbe – My old boss. Built her own business from nothing and constantly pushed me to get out of my comfort zone in a male-dominated space. We spent six months prior building our community online and testing brand concepts. A lot of our good friends and ambassadors came from this little experiment. Alex: Juggling multiple clients and being pulled in different directions. Loz: The defining moment came in November last year after a week-long market and having to rush to our warehouse on Monday morning before I started my other job to pack orders, it became apparent that it was going to be impossible to maintain both jobs. 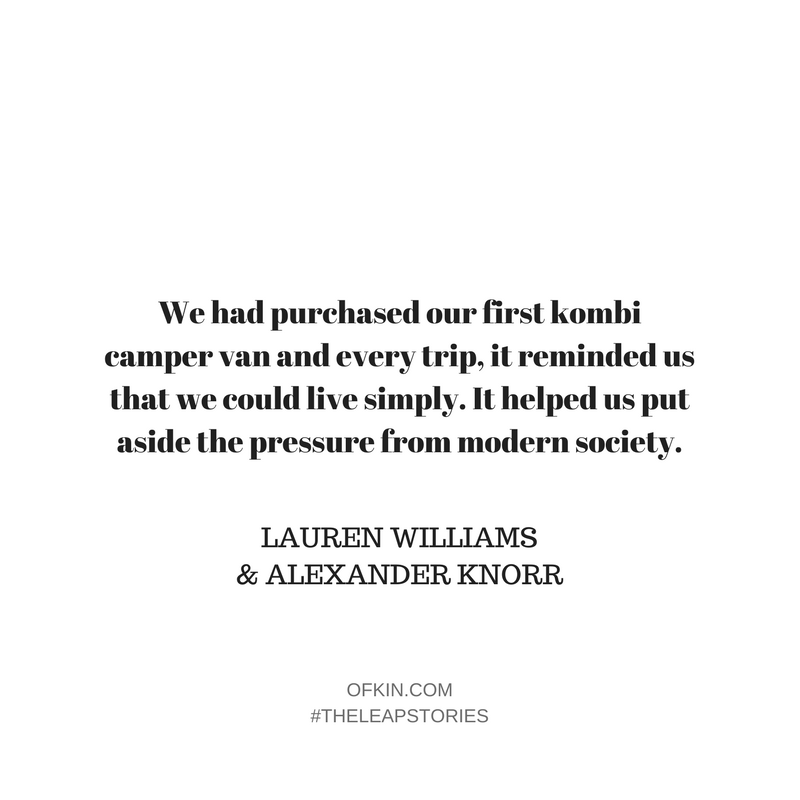 Loz & Alex: We had purchased our first kombi camper van and every trip, it reminded us that we could live simply. It helped us put aside the pressure from modern society. Looking back now it’s kinda odd that an object influenced our decision making this much – but it served as a totem and represented something bigger. Alongside our van, we knew as long we had each other we would be okay. 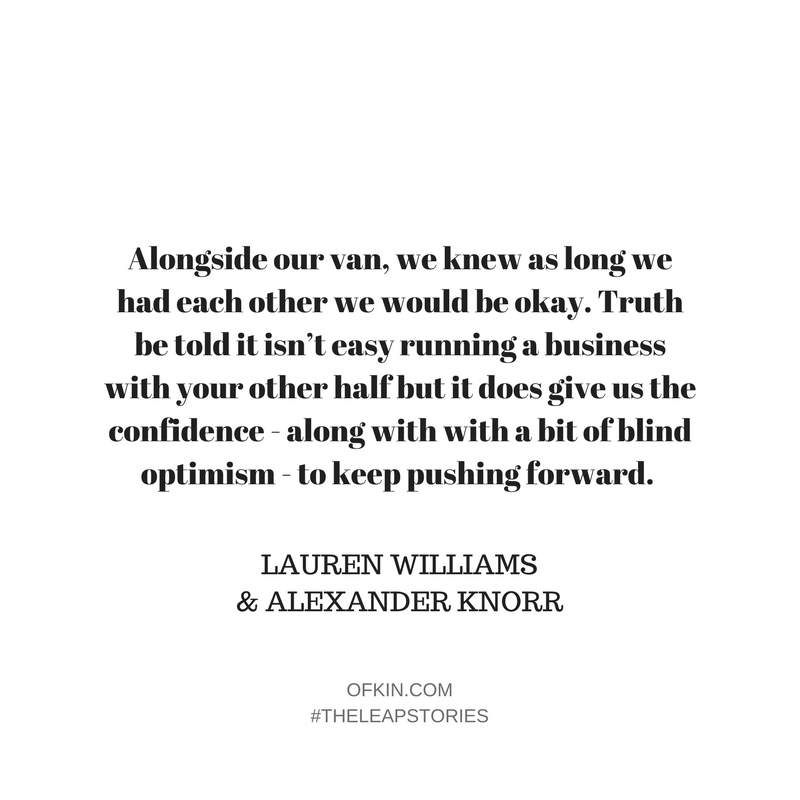 Truth be told it isn’t easy running a business with your other half but it does give us the confidence – along with with a bit of blind optimism – to keep pushing forward. Our personalities compliment each other and we know that no matter what direction we end up going we go together. Managing our fear of failure – this is easier said than done and we often have to remind ourselves. From the start we had a mantra of ‘treat everything as a learning experience’. We try not to fail but we realise we can’t always knock it out of the park either. 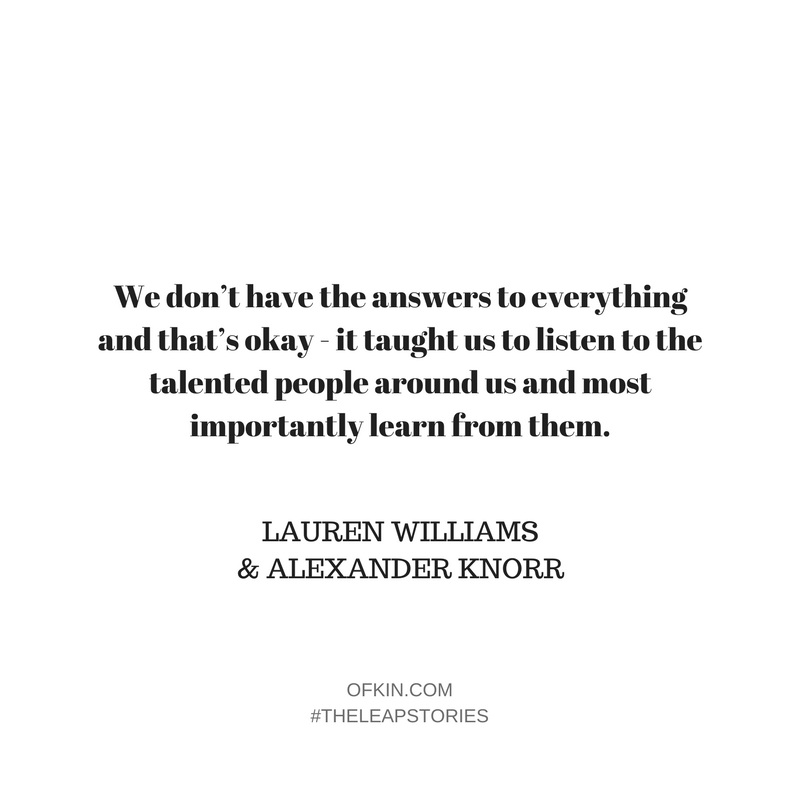 We don’t have the answers to everything and that’s okay – it taught us to listen to the talented people around us and most importantly learn from them. Our savings, this was definitely a turning point. 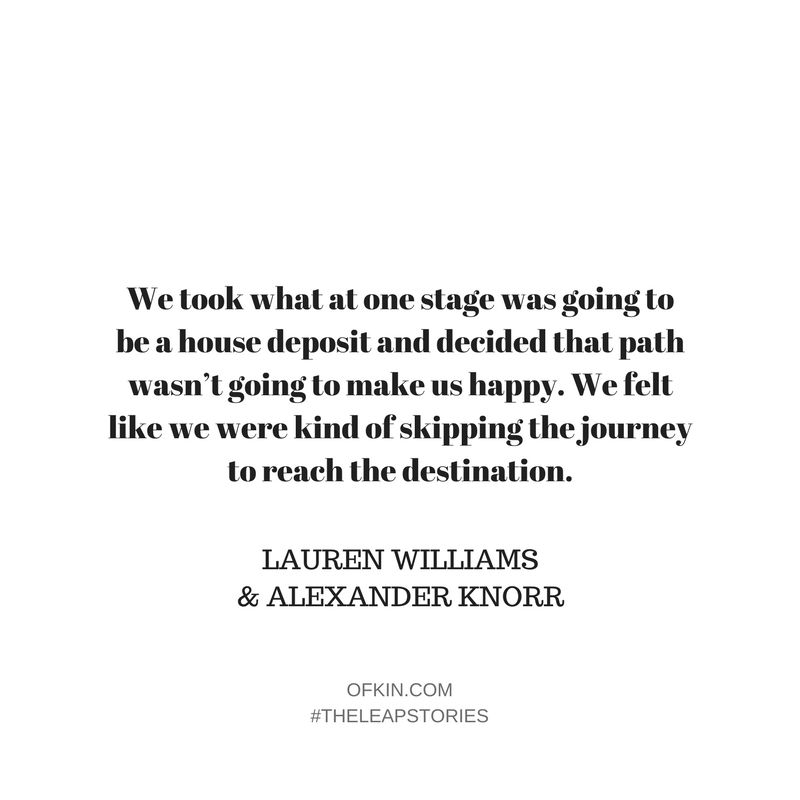 We took what at one stage was going to be a house deposit and decided that path wasn’t going to make us happy. We felt like we were kind of skipping the journey to reach the destination. Alex: After graduating and landing a gig at an engineering consultancy I knew I couldn’t work 9-5 for someone. Loz: I started my own business at 19. While it wasn’t the most successful business going around, I learnt so many valuable lessons that I still use to this day with my new business. Alex: Initially the one previously mentioned – we failed hard. I had to strip everything back and pivot. I learnt a lot about myself and how to deal with the reality of failure. It turns out to be one of the most defining moments of my life and lead to my freelance career which took me around the world designing for different brands. Loz: My first business didn’t go exactly as planned, but it’s hard to say it didn’t work out because I learnt so much. It’s funny to look back on it now, I often show people the photos from my first photoshoot just for giggles, I’ve definitely come a long way since then! The first six months to a year, it was definitely the fear of failure – but you learn to control it. And then something clicks and you realise failure is a learning experience, running a business has so many ups and downs, you just have to go along for the ride. 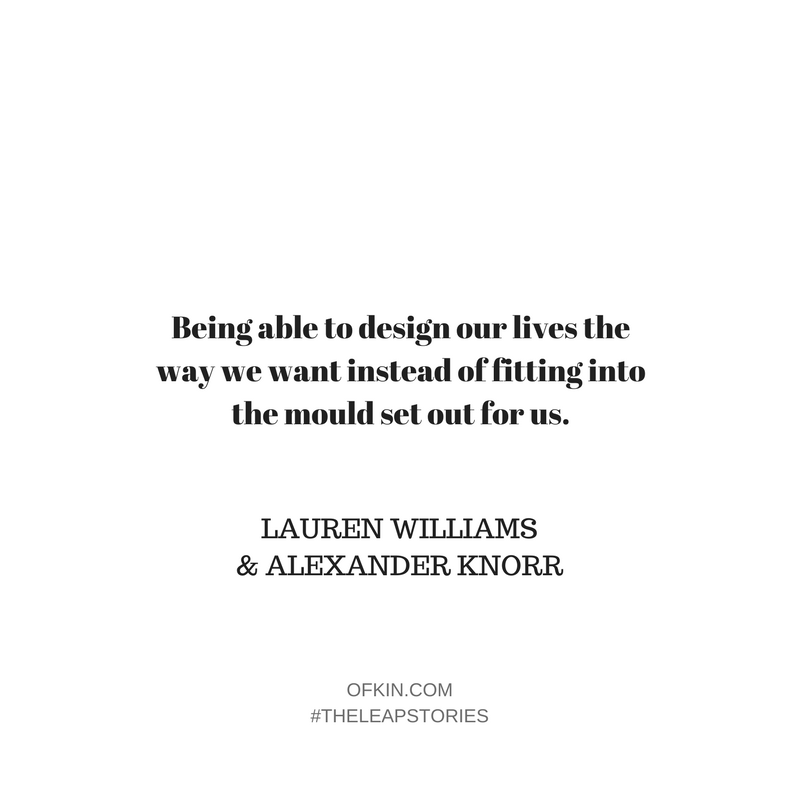 Being able to design our lives the way we want instead of fitting into the mould set out for us. Work/life balance – when you’re working for yourself it’s hard to switch off and it makes it especially hard when you’re working with your partner. We have to constantly remind ourselves to stop working and take some time off without checking our emails! No plans, we are open to anything so check in with us in six months and who know’s where we will be or what we will be doing. Set yourself up for the leap, you have to work hard to be in a position to take the leap. Put in the hard work and you will get there.